Number 15-14: Cardiac Involvement of Cystic Echinococcosis by CMR Imaging. Case from: Fateh Ali Tipoo Sultan2 ,Bennet George1, Imran Ahmed2, Vincent Sorrell1. A 70-year-old female residing in a remote, rural part of Pakistan presented with several days of chest pain and dyspnea concerning for acute coronary syndrome. Echocardiogram performed as part of her evaluation noted a cystic mass occupying the right ventricle. Cardiac magnetic resonance (CMR) was performed to evaluate the patient’s left ventricular function and to better characterize the cystic mass identified. Serologic immunofluoroscent antibody testing was positive for Eichinococcus granulosis. Subsequent evaluation demonstrated no evidence for involvement of other organs. The patient was advised to proceed with surgical resection due to the risk of cyst rupture of potential tamponade, but opted for medical treatment with albendazole. CMR Findings: Steady-state free-precision cine demonstrated the presence of a multi-loculated cystic mass, embedded within the interventricular septum and occupying a major portion of the right ventricular cavity (Figures 1 and 2). The polycystic mass was hypointense on T1 weighted images (Figure 3) and hyperintense on T2-weighted images (Figure 4). The right ventricular outflow tract appeared obstructed (Video 1). Cystic echinococcosis is a disease prevalent in a number of countries throughout the world. Humans become infected after contact with a definitive host, namely canines, or via consumption of contaminated water or vegetation. The liver and lungs are the most commonly affected organs while cardiac involvement represents roughly 0.5-3% of patients1. Cardiac involvement occurs by direct invasion of myocardium through coronary arterial circulation, infestation as a result of rupture of a cyst into a pulmonary vein, or via direct contact with a hepatic or pulmonary hydatid cyst2. The interventricular septum is the least common site of cardiac involvement (7%), while the left ventricle and right ventricle represent 75% and 18% of patients respectively3. Patient presentation varies depending on the number, location, and size of the cysts and patients may remain asymptomatic for years due to the slow progression of disease. Cyst rupture has been reported to manifest as acute coronary syndrome4. Management options include both drug therapy and surgical intervention. The differential diagnosis of intracardiac cystic masses should include intracardiac varices, bronchogenic cysts, and hydatid cysts as described above. Because CMR offers high tissue contrast images differentiating blood and soft tissue and provides a global anatomic view of the heart, it serves as an excellent modality to aid in preoperative planning. 1. Dighiero J, Canabal E. J., Aguirre C. V., Hagan J, Horjales J. O. Echinococcus disease of the heart. Circulation 1958 Jan;17(1):127-32. 2. Petik B, Hazirolan T, Uysal G, Erturk SM. 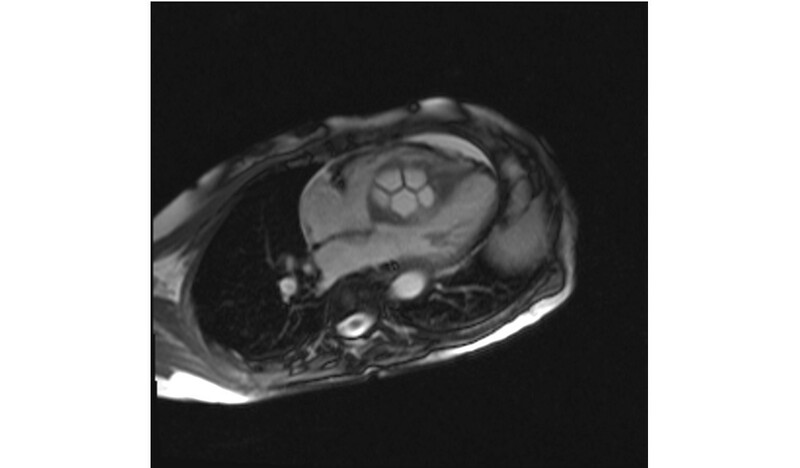 Cardiac Hydatid Cysts: Computed Tomography and Magnetic Resonance Imaging Findings of the 5 Cases. J Comput Assist Tomogr. 2015 Sep-Oct;39(5):816-9. 3. Thameur H, Abdelmoula S, Chenik S, et al. Cardiopericardial hydatid cysts. World J Surg, 25 (1) (2001), pp. 58–6. 4. Sharma P, Lakhia K, Malhotra A, Garg P. Ruptured intracardiac hydatid cyst presenting as acute coronary syndrome. Asian Cardiovasc Thorac Ann. 2015 Jun 4. Pii.